There’s never a boring moment here at CozyPure. Some days you come in to a ton of online orders, some days you are swamped with customers in our Norfolk, VA showroom, and some days it’s “lights, camera, action,” fortunately for me the latter isn’t too often. Today we were visited by Cheryl Tan and her camera crew to do a segment for HR Business Weekly, a 30 minute show produced by WVEC ABC13 and their partners, that serves as a resource and voice for entrepreneurs and small to medium sized businesses in the region. Cheryl Hahn being interviewed by Cheryl Tan for HR Business Weekly. They were here to interview Cheryl Hahn, our fabulous owner, as “entrepreneur of the week.” There is always plenty to say about our organic latex mattresses and Cheryl’s passion to her company,natural latex mattresses, organic bedding materials is inspiring to other local entrepreneurs. Cheryl let us know that filming would be taking place in the workshop and showroom today and my seat in the lobby is often a hot-spot for traffic so I knew to brush my hair. What we could not foresee is that one of our artisans would be out sick today. When the camera is on, you naturally want everything to look it’s best and CozyPure’s workshop looks best when everyone is busy working. So, guess who had to fill in? That would be me, the new girl. I’ve never operated a sewing machine in my life but for “staging purposes” I sat in front of one today and that is all I intended to do was “sit“. However, I was quickly approached by a true artisan that thought it would look even better if I was actually working and she taught me how to sew on a blanket’s binding. I never expected to sew today and I don’t expect to sew tomorrow but I’m glad I could fill an empty seat, while the cameras were rolling at least. Just for the cameras, I pretended to sew. The camera crew seemed mesmerized by our workshop bustling with activity – there is something aesthetically pleasing about seeing hands working with beautiful raw materials. 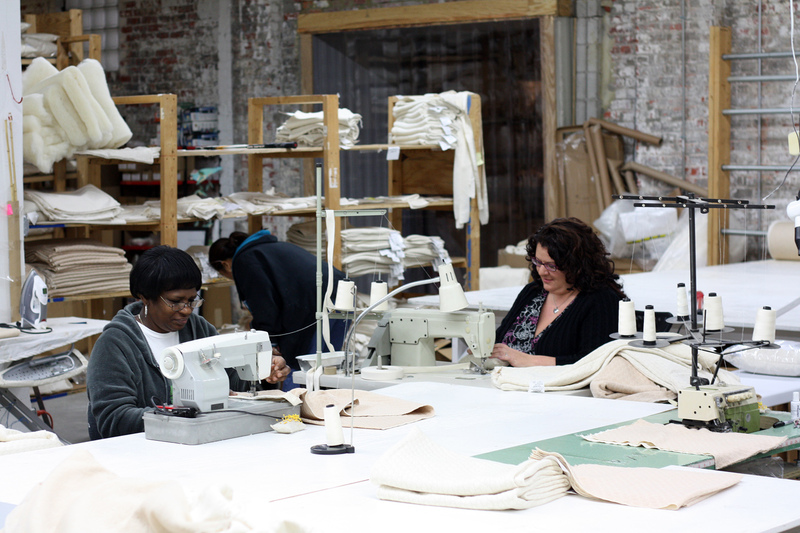 In our workshop our artisans make the finest bedding materials from all natural materials. 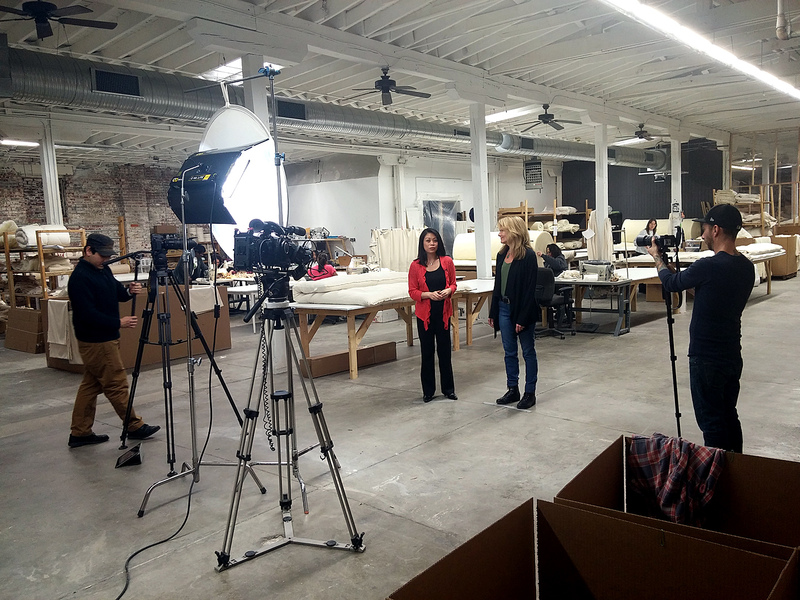 This behind-the-scenes look at the craftsmanship that goes in to every CozyPure mattress is sure to make a great video for the local viewing audience. 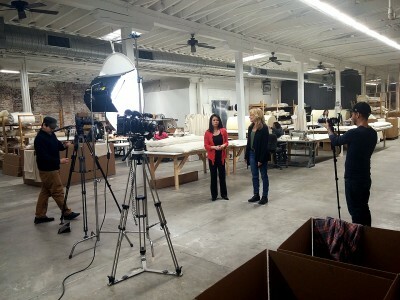 The camera crew captured the sewing of organic cotton, the tying of handmade wool comforters, even the creation of CozyPure’s exclusive LaNoodle pillows, hand filled with pure natural latex noodles. There are much more interesting things going on in the workshop than me pretending to be a seamstress, but that was the highlight of my day nevertheless. Written by Angela Carey, CozyPure’s newest team member. Angela brings over 15 years of experience in sales and marketing to the CozyPure staff and is currently greeting customers, answering phones and pretending to sew when the camera is on.